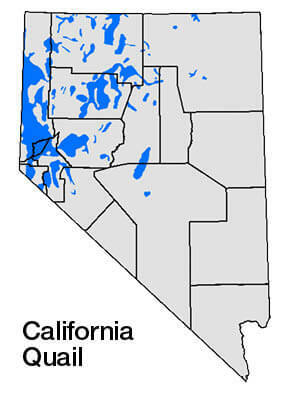 In Nevada, upland game bird species include blue and ruffed grouse, sage grouse, chukar and Hungarian partridge, snowcock, ring-necked pheasant, California, Gambel’s and mountain quail, and North American wild turkey. Small game species include cottontail, pygmy and white-tailed jack rabbits. Falconry seasons are in effect for waterfowl (all migratory bird stamp requirements apply), dove, chukar, sage, blue and ruffed grouse, pheasant, Himalayan snowcock, Hungarian partridge, quail and rabbit. Youth seasons include chukar and Hungarian partridge, California and Gambel’s quail, and cottontail, pygmy and white-tailed jack rabbits. 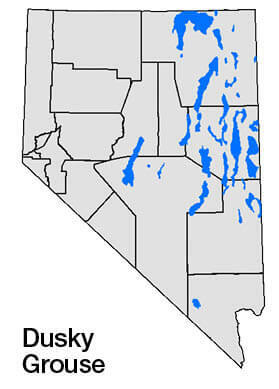 Carson City, Douglas, Elko, Eureka, Esmeralda, Humboldt, Lander, Lincoln, Lyon, Mineral, Nye, Washoe, White Pine. 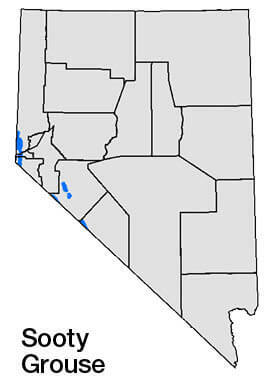 Limit: Limit singly or in the aggregate. Hunting Hours: Sunrise to sunset. As part of a long-term study of the state’s blue grouse populations, hunters are asked to remove one wing from each grouse taken. Please keep the wing dry and away from flies, deposit in a paper lunch sack and drop it off in any of the Department’s wing barrels, at check stations or with NDOW employees. 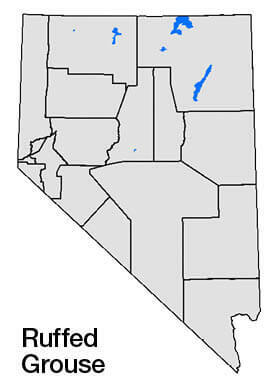 Persons harvesting ruffed grouse in Humboldt County are requested to report harvest in person to the Department of Wildlife office, in person or by mail at 705 E. Fourth St., Winnemucca, NV 89445. Phone (775) 623-6565. When hunting blue grouse or ruffed grouse please recognize NAC 503.185 which states: A person shall not transport a blue or ruffed grouse within this State unless the head or one fully feathered wing remains attached to the grouse from the time it is removed from the place where it was taken until it arrives at the person’s residence or a commercial facility for its preservation. Hunt Unit or portion of hunt unit 012 in Humboldt County. 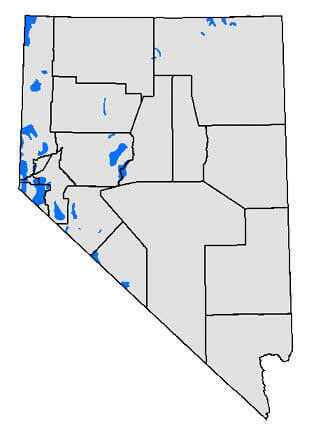 Unit 033 of Washoe and Humboldt Counties (Sheldon NWR) excluding the Little Sheldon and other areas as posted. Note: Up to 4 applicants may apply as a party. Parties may be comprised of a combination of residents and nonresidents. 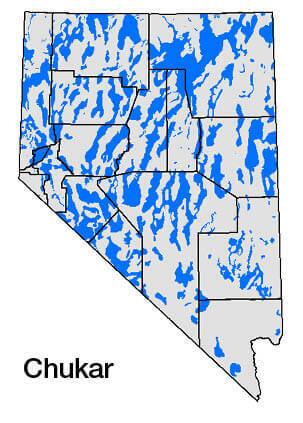 Sheldon Special Sage-grouse Hunt applications must be submitted online through www.ndowlicensing.com. Paper applications will not be accepted. Applications will be accepted until 11 p.m. Aug. 3, 2018. Successful applicants will be notified via e-mail. 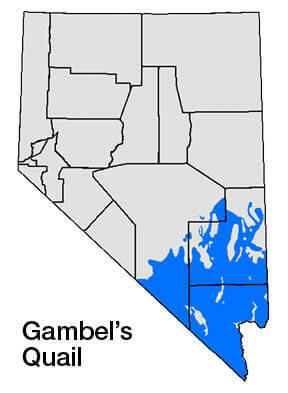 The Nevada Department of Wildlife is conducting a long-term study of the state’s sage grouse populations and is collecting wing samples to help determine the status of the sage grouse population in Nevada. Sage grouse hunters are asked to remove one wing from each sage grouse taken. 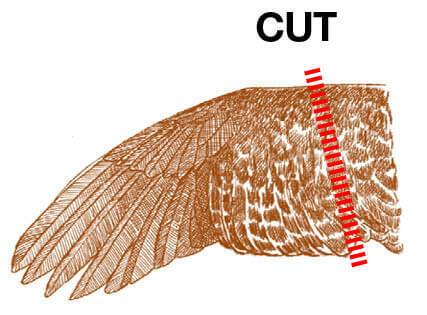 This diagram illustrates where the wing should be cut. Please keep the wing dry and away from flies. A paper lunch bag works well. Deposit the wing at any of the Department’s wing barrels, at check stations, or with Department employees who contact you in the field. 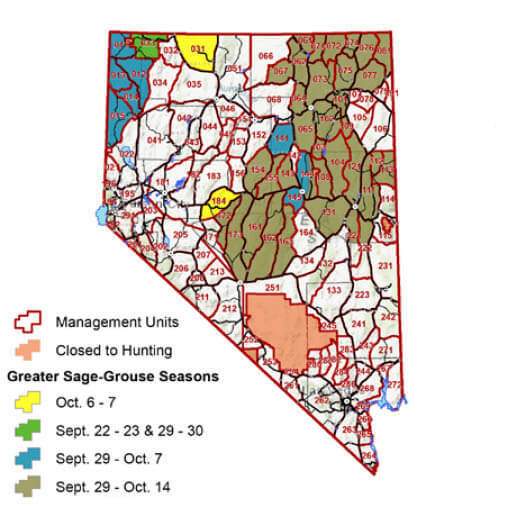 Due to large fire occurrence in sage grouse habitat this year, hunt units may be subject to closure upon approval by the Nevada Board of Wildlife Commissioners. Prior to hunting Himalayan snowcock, persons must obtain a snowcock hunting free-use permit available online at www.ndowlicensing.com. Limits: Limits for mourning dove and white-winged dove are singly or in aggregate. Hunting Hours: 1/2 hour before sunrise to sunset daily. Shotguns must be plugged to limit overall shotshell capacity to 3 when hunting dove. Note: The Eurasian Collared Dove is an unprotected species, and does not count towards your bag limit. HIP Requirements: Any person 12 years or older who hunts dove is required to obtain a Harvest Information Program number ANNUALLY by visiting www.ndowlicensing or calling 1-855-542-6369. Hunting Hours: Sunrise to sunset daily. Note: All crows must be retrieved and removed from the field. Season closed on common ravens. See illustration. The crow (17.5 inches) is bigger than a blackbird (9 inches) and noticeably smaller than a raven (24 inches). Crows often flock, while ravens are more solitary birds. 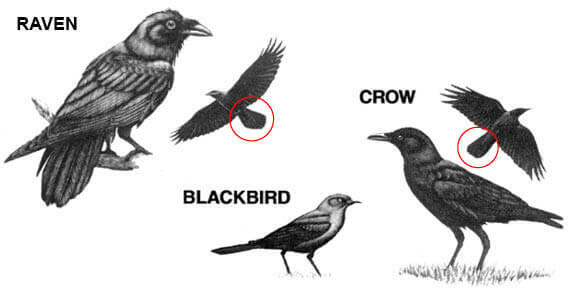 Note that the crow’s bill is much smaller than the raven, and that its tail is square. The raven’s heavy bill, shaggy throat feathers and wedge-shaped tail also set it apart from the common crow. Open to hunters 17 years of age or younger only. Youth must be accompanied by an adult who is at least 18 years old. License requirements apply pursuant to NRS 502.010 and NRS 502.292. 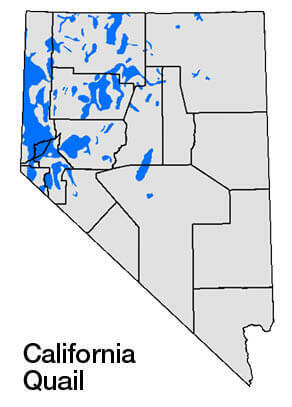 Limit: Limit singly or in the aggregate except for pygmy rabbit where limits may not include more than 2 daily and 6 in possession. Limit: Limit singly or in aggregate. Limit: Limit singly or in the aggregate, except for mountain quail where limits may not include more than two daily and six in possession. Limits: Limit singly or in aggregate. The Department of Wildlife is interested in collecting harvest information on mountain quail throughout Nevada. The Department requests that hunters contact the Reno Headquarters at (775) 688-1523 or an NDOW representative to report your mountain quail harvest. 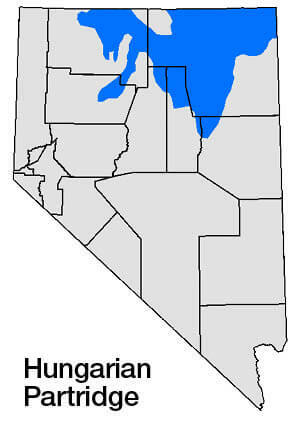 Limit singly or in the aggregate except for pygmy rabbit where limits may not include more than 2 daily and 6 in possession. 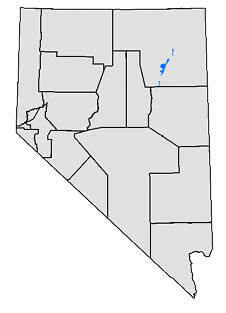 The Department of Wildlife is interested in collecting harvest information on pygmy rabbits throughout Nevada. 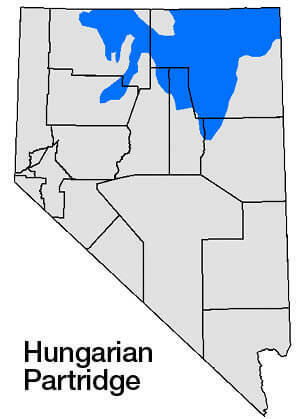 The Department requests that hunters contact the Reno Headquarters at (775) 688-1523 or an NDOW representative to report your pygmy rabbit harvest. Shooting Hours: Sunrise to sunset.